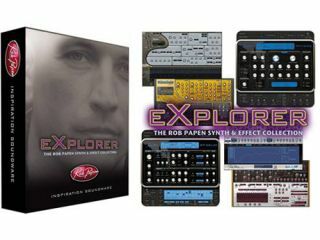 NAMM 2011 PRESS RELEASE: Combining all Rob Papen virtual synths, plus the company's two award-winning effects plug-ins, eXplorer provides all the tools you need for contemporary music production including thousands of rich, complex, track-ready presets created by Rob Papen and guest artists, including acclaimed D'n'B artists Noisia. What's more, this collection only requires one authorisation - which covers all the included titles - so it not only saves you money but a shedload of time too! SubBoomBass: Ultra deep groove bass synth with built-in step sequencer. Predator: Phat analog synth with killer presets and first class features. Also includes Predator FX - a filter, modulation, vocoder and effects plug-in. RG: Electric and acoustic guitar grooves with sequencer and synth effects. RP-Verb: An advanced, transparent and musical algorithm with easy controls.